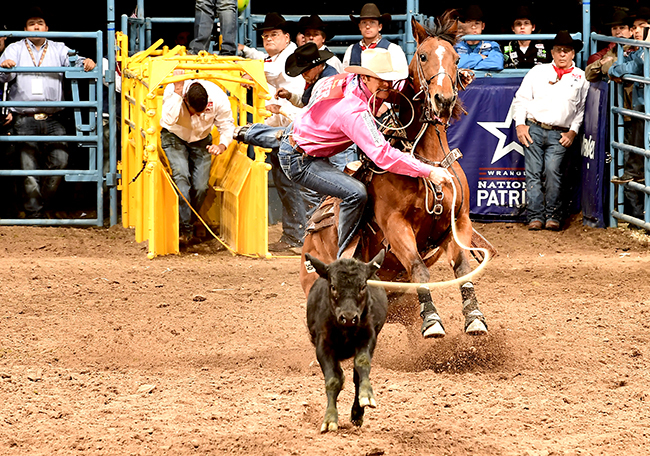 LAS VEGAS – Tyson Durfey had almost given up on his dream of winning a world championship. He put the wraps on his first world title Saturday on the final night of the Professional Rodeo Cowboys Association season by stopping the clock in 7.4 seconds. He finished in a tie for third in the NFR’s 10th round, worth $13,327. He also finished second in the average race with a 10-run cumulative time of 94.0 seconds. That was worth an additional $54,577. In all, he earned $148,000 in his 10 days in Las Vegas and pushed his year-end earnings to $212,445. He edged Brazilian Marcos Costa by $3,518 to claim the coveted gold buckle, moving up from 14th in the world standings when the NFR began Dec. 1. “This experience is unbelievable for me,” said Durfey, who became a first-time father to Praise Royal on Sept. 1 with his wife, Shea. “I used to get up at 4 in the morning, practice, flank and tie, ride horses, feed animals and go to school. I’d come back, rope on 10 more horses, shoe a few, and that was a day’s worth of work and didn’t allow for much time to sleep. He has chased his gold buckle dreams since, pushing hard the last decade. He first qualified for the NFR in 2007, and his best finish prior to this season was third in the final 2009 world standings. From the birth of his daughter to scrambling to make the finale, the 2016 ProRodeo season is one for his memory banks. A man of strong faith, he persevered through prayer and the support of his family. “The way I look at this year is it was just meant to be,” Durfey said. “From all the things that happened to making the finals at the end of the regular season to having a beautiful baby to having to miss Ellensburg (Wash.) to be there for her birth, even when I was outside the top 15. I had a horse that almost died that God healed to my wife performing here at the NFR, all this stuff came together for me. The dream has become real, and that reality will sink in soon enough. He has the gold buckle to prove it.